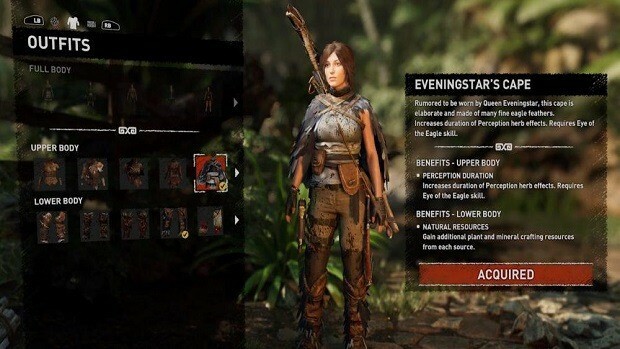 Shadow of the Tomb Raider Outfits Unlocks Guide will help you with acquiring and crafting outfits in the game as each provides unique bonuses and benefits in combat and exploration. 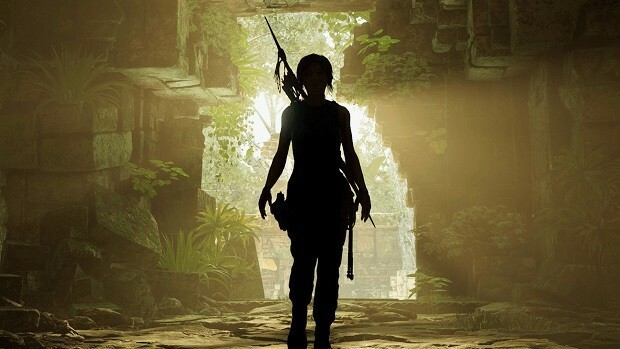 There are a number of outfits in Shadow of the Tomb Raider and one can get lost while trying to unlock all of the outfits. 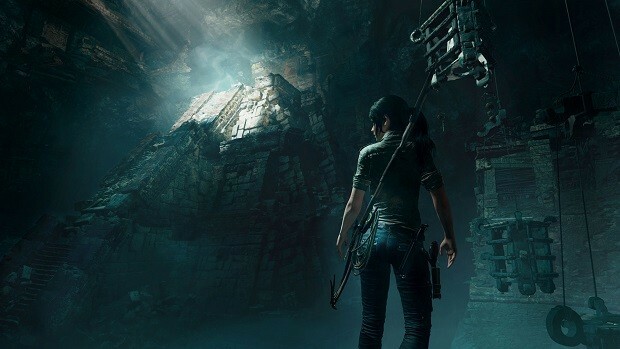 That is where our Shadow of the Tomb Raider Outfits Unlocks Guide comes in to help you with how to unlock the outfits and their crafting. Like Rise of the Tomb Raider, Shadow of the Tomb Raider features multiple outfits for Lara Croft that she can acquire and wear. Moreover, each outfit comes with bonuses that will help players in combat and exploration. 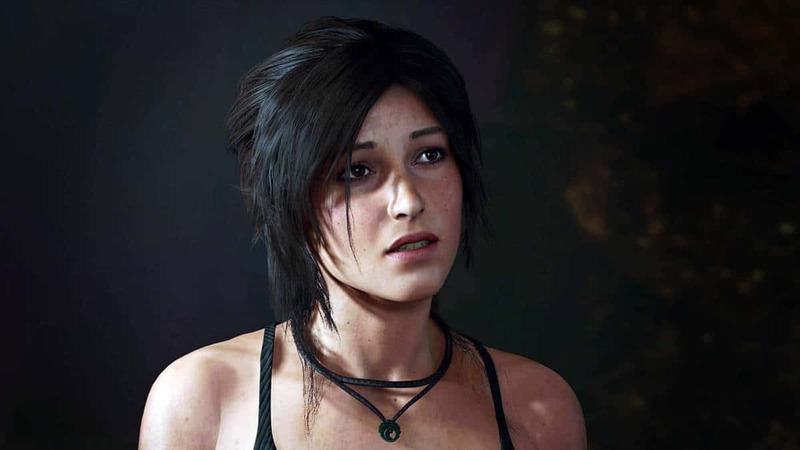 There are three types of Shadow of the Tomb Raider Outfits which are Upper Body, Lower Body, and Full Body. The Full Body Outfits in the game cannot be customized or combined with any other outfit. However, Upper Body outfits and Lower Body outfits can be mixed and matched to gain bonuses of your liking. 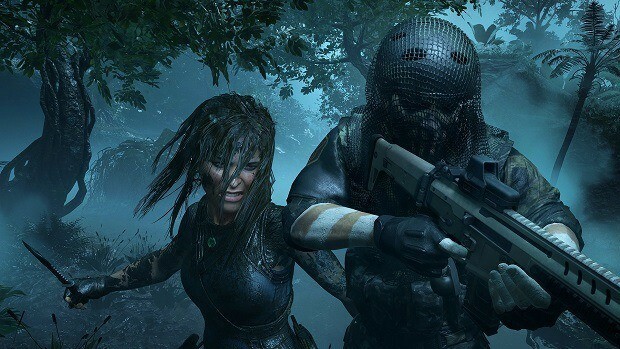 There are quite a lot of outfits in Shadow of the Tomb Raider for players to collect and that is where our Shadow of the Tomb Raider Outfits Unlocks Guide comes in to help you collect them all and craft them. 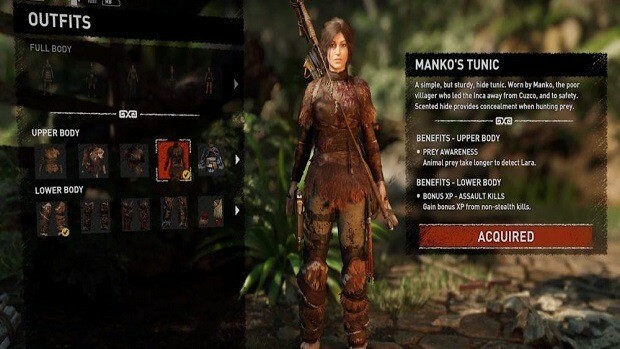 Before we explain how you can gain outfits in our Shadow of the Tomb Raider Outfits Unlocks Guide the following are the general ways through which you will be unlocking a number of Shadow of the Tomb Raider Outfits. Exploration: You Will Find Outfits in Small Crypts and Tombs. Merchants: Players Can Buy Outfits From Merchants. Progress through Campaign: Players Will Acquire Outfits Through the Game’s Story. This outfit is just too hard to miss, however, for the complete outfit, you need to acquire the Vest of Empress Jaguar and Boots of Empress Jaguar. To acquire the Vest of Empress Jaguar and the Boots of the Empress Jaguar, you need to defeat the Empress Jaguar in the Peruvian jungle. The Empress Jaguar outfit in the game is suited for stealth as this suit will make Lara Croft a little hard to detect and she will make very little noise while running. Vest of Empress Jaguar requires 1 Hide, 1 Fat and 1 Dark Jaguar Hide to craft while the Expert upgrade requires 1 Hide and 1 Fat. The Boots of Empress Jaguar require 4 Hides, 8 Cloth and 1 Dark Jaguar Hide while the Expert upgrade demands 2 Hides and 3 Cloth. This outfit is divided into two parts, the Yaway’s Battle Tunic, and Yaway’s Wooden Greaves. To acquire the Yaway’s Battle Tunic, you need to complete the side quest “Wolf at The Door – Widow’s Tears” in Paititi. As for the Yaway’s Wooden Greaves, you will find this one in the crypt in Paititi. This outfit provides resistance from fire and from being stumbled in combat. In addition to that, the Yaway Outfit increases Endurance Plant Effect that will provide a longer resistance from damage but also requires Heart Of Jaguar Skill. To craft the Yaway’s Battle Tunic you will need 4 Hides, 8 Cloth and 1 Jaguar Hide and the Expert upgrade requires 2 Hides and 3 cloth. The Yaway’s Wooden Greaves, on the other hand, requires 4 Hides, 3 Hardwood and 2 Jaguar Hides to craft while the Expert upgrade requires 2 Hides and 1 Hardwood. This Shadow of the Tomb Raider outfit also consists of two parts, Mantle of Six Sky and Greaves of Six Sky. The Mantle of Six Sky can be acquired from one of the merchants in Paititi and the Greaves of Six Sky can be acquired from one of the crypts in Paititi. The Mantle of Six Sky allows Lara to take less damage from Bullets and arrows while the Greaves of Six Sky allows for faster health regeneration. The Six Sky Outfit is best for combat scenarios. To craft Mantle of Six Sky players require 12 Feathers, 2 Jaguar Hides, and 2 Eagle Feathers and the Expert upgrade requires 4 Feathers and 1 Jaguar Hide. This outfit has two parts, the Ch’amaka’s War Vest and Ch’amaka’s Greaves. The Ch’amaka’s War Vest can be acquired from one of the crypts in Paititi. The Ch’amaka’s Greaves will be acquired by completing the side quest “In the Midnight Hour – Freedom” in Paititi. With Ch’amaka’s War Vest, Lara Croft takes less damage from melee attacks while Ch’amaka’s Greaves give bonus XP for any non-stealth kill. To craft Ch’amaka’s War Vest, you need 4 Hides, 8 Cloth and Black Maned Wolf Hide and the Expert upgrade requires 2 Hides and 1 Cloth. The Ch’amaka’s Greaves requires 3 Hides, 5 Fat and 2 Black Manes Wolf Hide while the Expert upgrade demands 1 Hide and 2 Fat. This Shadow of the Tomb Raider has two parts, Condor Cowl of Urqu and Hide Boots of Urqu. The Condor Cowl of Urqu can be found within one of the Kuwag Yaku crypts while the Hide Boots Of Urqu can be acquired from a merchant in Kuwag Yaku. The Condor Cowl of Urqu allows for increased focus time provided you have unlocked the “Scales of the Serpent” skill. The Hide Boots of Urqu provides bonus XP from stealth kills. Without a doubt, this outfit is suited for stealth scenarios. The Condor Cowl of Urqu requires 4 Hide, 3 Condor Feathers and 2 Black Maned Wolf Hides while the Expert upgrade requires 2 Hides and 1 Condor Feathers. As for the Hide Boots of Urqu, it requires 3 Hides, 3 Condor Feathers, and 2 Black Maned Wolf Hides. The Expert upgrade requires 2 Hides and 2 Cloth. Manko Outfit can be acquired by completing one of the Crypts in Paititi which will provide you with Manko’s Boots. The Crypt is located across the lake and players are required to use Rope arrow to cross. Players will receive Manko’s Tunic by completing the side quest “Draw Weight Heavily – The Champion’s Bow” in Paititi. 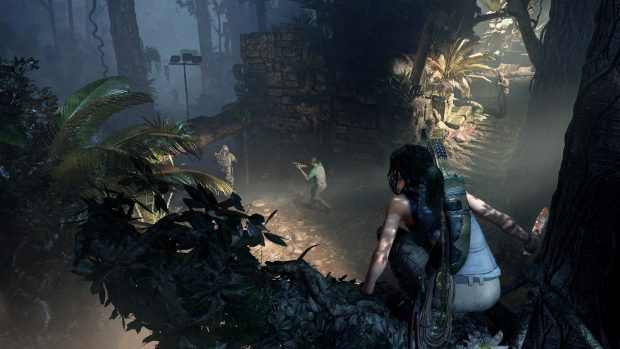 The Manko’s Tunic will make the prey to take longer to detect Lara while the Manko’s Boots will make animal predators to take more time to detect Lara Croft. This outfit is best for hunting animals. The Manko’s Tunic needs 4 Hides, 4 Cloth and 2 Black Maned Wolf Hides while the expert upgrade requires 2 Hides and 2 Cloth. The Manko’s Boots demand 4 Hides, 4 Cloth and 4 Black Maned Wolf Hide while the Expert upgrade requires 2 Hides and 2 Cloth. The Eveningstar Outfit can be unlocked after completing both Crypts in the Peruvian Jungle. One crypt is located near the Plane Wreckage base camp while the second one is located near the Plane Fuselage base camp. These crypts will provide you with Eveningstar’s Cape and Eveningstar’s Boots. Eveningstar’s Cape will increase Perception plant effect but requires Eye of the Eagle skill. The Eveningstar’s Boots will Lara the ability to gain more plant and mineral crafting resources from the source. Once you have cleared out these crypts all you have to be craft the Eveningstar Outfit. The Eveningstar’s Cape requires 4 hides, 8 cloth and 2 Eagle Feather to craft. While the Expert upgrade will cost 2 Hides and 3 Cloth. The Eveningstar’s Boots requires 3 Hides, 8 Cloth and 2 Eagle Feathers to craft and the Expert upgrade requires 1 Hide and 3 Cloth to craft. The Nine Strides’ Harness can be purchased from the merchant in Kuwag Yaku. However, Nine Strides’ Boots can be found in the Crypt to the west of Kuwag Yaku. Once you clear the crypt and acquire the boots, you will just need to craft them. 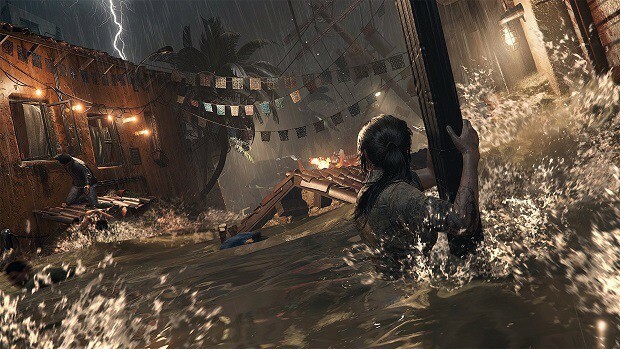 Nine Strides’ Harness allows for more ammunition crafting while Lara is on the move while Nine Strides’ Boots grant Lara the ability to gain more resources like fat, black powder, and salvage from their sources. To craft Nine Strides’ Harness, you need 6 Hides and 4 Cloth while the Expert upgrade requires 3 Hides and 2 Cloth. The Nine Strides’ Boots require 6 Hides and 4 Cloth to craft while the Expert upgrade requires 3 Hides and 2 Cloth. Players will acquire the Kantu’s Gilded Vest in one of the missions that will send you to San Juan Crypt and the Kantu’s Boots can be bought from one of the merchants in Paititi. The Kantu’s Gilded Vest bonus XP from hunting while the Kantu’s Boots grants Lara the ability to acquire more hide and fat from animals. To craft Kantu’s Gilded Vest you need 3 Hides, 8 Cloth, and 2 Jaguar Hides while the Expert upgrade requires you to have 1 Hide and 3 Cloth. The Kantu’s Boots the demands 3 Hides and 8 Cloth and 2 Jaguar Hides while the Expert upgrade demands 1 Hide and 3 Cloth. The Crimson Huntress Outfit is a full body outfit that can be purchased from Moraekah merchant in Paititi. This particular outfit grants Lara the ability to acquire bonus XP from hunting animals, and increased Focus Time that will allow Lara to slow time longer while aiming but requires Scales of the Serpent skill. To acquire this outfit, players are required to find two separate pieces namely Quenti Palla’s Mantle and Quenti Palla’s Greaves. To acquire the Quenti Palla Outfit you need to select Eagle Path in New Game+ or you can buy both pieces of the Quenti Palla Outfit from the merchant in Kuwaq Yaku. To craft Quenti Palla’s Mantle you will need 6 Hides, 12 Feathers, and 1 Eagle Father and for the Expert upgrade you need 3 Hides and 4 Feathers. The Quenti Palla’s Greaves demands 6 Hides, 12 Feathers, and 1 Eagle Feather while the Expert upgrade requires 3 Hides and 4 Feathers. Bith Quenti Palla’s Greaves and Quenti Palla’s Mantle grants Lara the ability to acquire Rare resources while looting animals and enemies. This outfit consists of two pieces namely Ozcollo’s Tunic and Ozcollo’s Greaves. To acquire the Ozcollo Outfit, players just need to select the Jaguar Path in the New Game + or you can just buy this outfit from the merchant in Kuwaq Yaku. The Ozcollo’s Tunic grants Lara the ability to deal more damage if her health is critically low. The Ozcollo’s Greaves grant Lara the ability to gain bonus XP from non-stealth kills. To craft Ozcollo’s Tunic, you will need 6 Hides, 10 Cloth, and 2 Jaguar Hide while the Expert upgrade demands 3 Hides and 4 Cloth. As for the Ozcollo’s Greaves, you need 6 Hides, 10 Cloth, and 2 Jaguar Hide while the Expert upgrade needs 3 Hides and 4 Cloth. To grab the Three Fangs Outfit you need to select the Serpent Path in New Game+ or you can purchase it from the merchant in Kuwaq Yaku. There are two pieces of this outfit namely Three Fangs’ Tunic and Three Fangs’ Greaves. To craft Three Fangs’ Tunic, you need to have 6 Hides, 10 Cloth, and 2 Black Maned Wolf Hides. The Expert upgrade for this requires 3 Hides and 4 Cloth. The Three Fangs’ Greaves requires 6 Hides, 10 Cloth, and 2 Black Maned Wolf Hides while the Expert upgrade demands 3 Hides and 4 Cloth. Both Three Fangs’ Tunic and Three Fangs’ Greaves grants Lara the ability to greatly resist fire damage thanks to the Endurance but requires players to have Heart Of The Jaguar skill. This is a Lara Croft’s default Outfit in the game and offers no bonuses at all. This is a full-body outfit and is one of the default outfits for Lara Croft. This outfit does not offer any bonuses. This is a full body outfit for Lara Croft and players will acquire it when they enter Paititi. This outfit will allow Lara to interact with the rebels. This full body outfit will be automatically acquired when players return to Paititi after they escape Cenotes. This outfit allows Lara to interact with the Cultists. 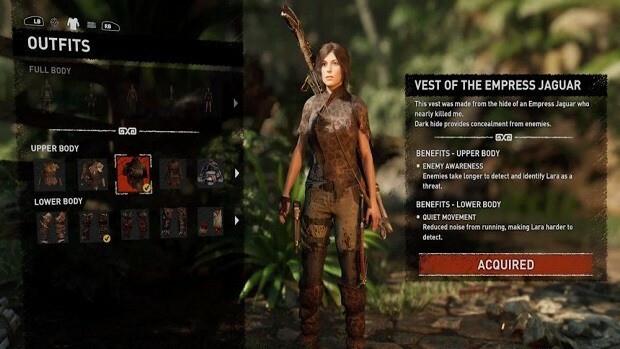 The Classic Outfits in Shadow of the Tomb Raider are available by default and do not really require players to put an effort in order to acquire them. Classic Outfits do not have any benefits or requirements and players are free to use them anytime. Shadow of the Tomb Raider Classic Outfits includes three outfits which are following. To change outfits in Shadow of the Tomb Raider, you need to get to the campsite. The first one unlocks once you reach the jungle which takes about an hour to reach in the game. 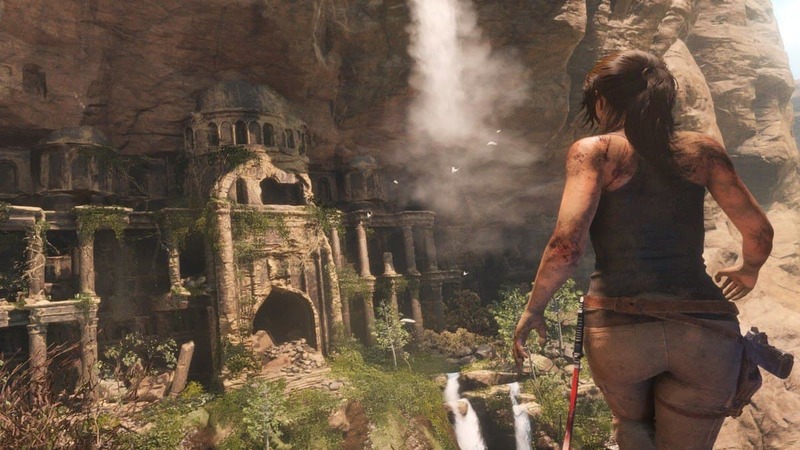 Campsites allow Lara Croft to upgrade her weapons and her skills. Go to the camp, open inventory and switch tabs. Here you will be able to change Lara Croft’s outfits and see which outfit provides what benefits. This Shadow of the Tomb Raider Outfits Unlocks Guide is a work-in-progress we will add more outfits as we find more of them as we play the game.